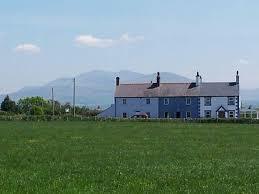 For some years I lived in a house on top of a small hill near the village of Llangaffo on the Isle of Anglesey. It had spectacular views of the sea on three sides and a breath-taking view looking down over the Menai Straits with its iconic bridges and directly on to Mount Snowdon beyond. I bought the house just for the view because, quite frankly, it was not just in a ridiculously isolated place, but was in an horrific state of repair. Years were spent simply making it habitable and getting rid of the invasive damp and expelling the hordes of rodents and gastropods which had taken up residence many generations before I moved in to what had been, for some years, an empty property. In my first year I had a massive bonfire on which I threw tons of mildewing, rotting furniture which had been left behind by some previous owner – to this day I can recall the hissing and spitting of the flames as they dried out the sodden wood and ignited the hordes of woodworm which had perforated just about everything made of wood. Where the harmonium had come from, I don’t know. How it had been painted pink was an even greater mystery. But I called in a pest control man who got rid of the mice who had nested in the bellows and chewed the leather to extinction and chemically removed all surviving woodworm, and then I called in a musical instrument maker to get it back into playing order. I often wished I’d had enough money to call in a furniture restorer to get rid of the pink paint, but I decided to do it myself – and the instrument spent the rest of its days streaked with bare wood, black varnish and various shades of pink depending on how assiduous I had been with the paint stripper and the sander. But it sounded good. It was operated by two foot pedals which you pumped to get air into the bellows, while your knees could press outwards on two wooden bars, the one on the left controlling the volume, the one on the right cumulatively adding the stops, of which there were about fifteen. The more energetically you pedalled, the more consistent was the tone, but equally the more insistent was the noise of the pedals. Its stops, with names like “Flute Harmonique”, “Diapason” and “Clarionet” all made roughly the same sound – a kind of wheezy reedy warble which by no stretch of the imagination could pass as the sound of the organ it most pitifully tried to emulate. It was even called a “Reed Organ”. Memories of my pink streaky harmonium have been stirred this week as I prepare to perform tonight, at Singapore’s Victoria Concert Hall, the harmonium part of Schoenberg’s arrangement of Johann Strauss’s Roses from the South. Yes – you read that right – Schoenberg, arranging Johann Strauss II for harmonium (and piano, and string quartet). He did it in May 1921 for one of his “Society for Private Musical Performances” in Vienna. 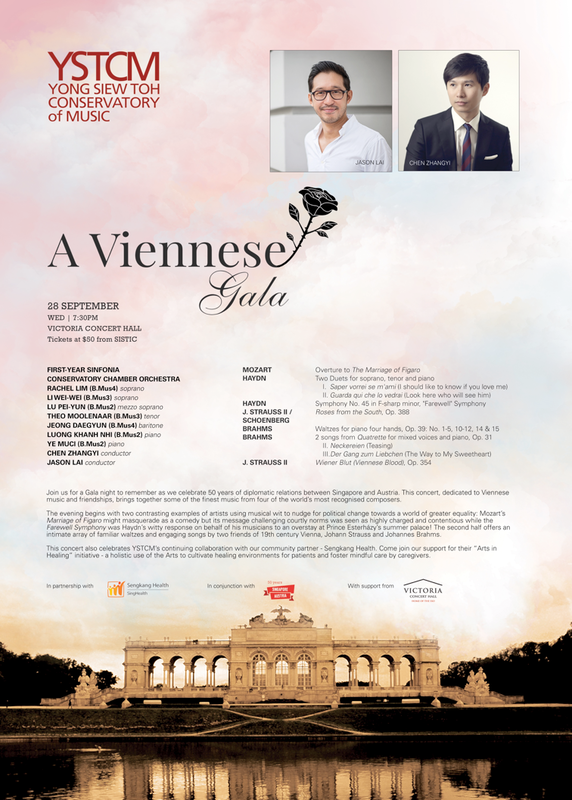 These concerts were intended to promote the then revolutionary works of what we have taken to referring as the Second Viennese School, and Schoenberg felt that by including some popular Strauss but in arrangements for unusual instrumental ensembles, he would be forging a link between Viennese tradition and the Second Viennese School. We know that the room in which the concerts were held was small and intimate, but it contained a harmonium which Schoenberg decided would effectively fill in the wind parts of Strauss’s original. The effect is weird, and I remain unconvinced that Schoenberg was really serious: I can’t help but think he was being somewhat facetious in creating a sound of such odd domesticity with its overtones of fringe protestant prayer meetings. Why the fringe protestant prayer meetings? Well, for those who don’t know, the harmonium was originally conceived by a French instrument maker in 1842. It was seen as a portable organ which Christian missionaries could take with them to outposts of Empire in order to provide appropriate musical support for their worship services. Thus harmoniums found themselves spread far and wide, cropping up in Mission churches and carted through jungles along with Bibles and Prayer Books. Most famously the missionaries took it to India during the 19th century, where the Indians took it to heart and made it an integral part of their own musical culture, reducing the size and scope and thereby expunging any lingering residue of Christianity from it. 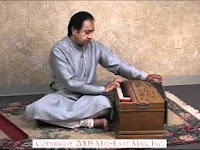 In Asia, most people regard the harmonium as an Indian instrument, and when people got to hear that I was playing a harmonium in tonight’s concert, they wondered how I would look sitting cross-legged on the floor in Indian fashion. The harmonium, in its European guise, is generally a free-standing single keyboard instrument which makes sufficient sound to support a small congregation and has a limited dynamic and tonal range, restricted largely by the fact that the sound is entirely produced by small reed tongues which vibrate freely within the instrument and are usually placed just below the keyboard. It was ideal for the myriad of non-conformist chapels which spread around Wales during the 19th century, and I imagine my pink model had been removed from one of these. But while it was popular in Wales, and parts of England where worship was carried on in small chapels, that was nothing to its popularity in America. No less than 247 different US-based companies were manufacturing the harmonium in the last decades of the 19th century. No wonder it is often referred to as the “American Organ”. In France it was taken rather more seriously as a musical instrument in its own right, and it was so accepted as a practice and teaching instrument for organists to have in their homes, that it started to gather its own repertory; recognisable from the title page which will often describe a work as being for “orgue espressif” – the name the French gave to the seriously musical harmonium. With some major French composers treating the instrument seriously, others found a use for it in their scores; notably Tchaikovsky (Manfred Symphony), Rossini (Petite Messe Solennelle) and Korngold (Much Ado About Nothing), while it seems that Saint-Saëns’ so-called “Organ” Symphony was given its first performance in London’s St James’s Hall on a harmonium, because the main organ had been dismantled. In the light of that, Schoenberg’s use of the harmonium should not seem quite so outlandish as it does to our minds today. The harmonium’s demise was as rapid as its rise. The end of European colonial ambitions saw a change in the approach of Christian Missionaries (today missionaries carry food, medicines and education rather than harmoniums, which might or might not be a good thing), the widespread closure of non-Conformist chapels in Wales and the falling away of church-going generally in the west saw worship services concentrated in larger buildings, while the final nail in the coffin of the harmonium was the invention of electronics. 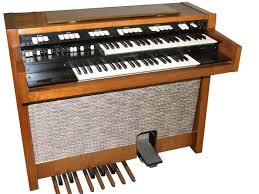 The colourless Hammond organ and the bland Lowry killed off the harmonium barely 100 years after it had first been patented. So the ultimate irony is that, without a single working harmonium in Singapore (excluding, of course, the Indian derivative, which has shrunk to the point whereby it cannot realistically work in a western musical setting) tonight’s performance will be on an electronic organ. Hours of careful experimentation have resulted in my finding a harmonium-like sound from it, but how I wish I had my old Pink Friend with me; that would have been just the right colour for Schoenberg’s eccentric take on Strauss. Interesting. I recently played the harmonium in a chamber arrangement of Mahler 1 in the same tradition of Schoenberg you described but alas not from the man himself. The combination of knee and foot pedalling was a challenge right from the opening long A, especially because the intonation was directly affected by the wind it received. I wonder if there exists a single harmonium in SG. I know of someone who has a working one at home salvaged from a church, albeit a rather small one.